Here is a little engine that demonstrates a magnetic property known as the Curie Effect. Normal magnets and also materials which are attracted to magnets (such as iron and nickel) are referred to as ferro-magnetic. The French scientist Pierre Curie discovered that ferro-magnetic materials have a critical temperature, at which they lose their ferro-magnetic behaviour. For example if you heat a piece of iron to 770 degrees Centigrade, which is its Curie Point, the piece of iron loses its ferro-magnetism and is no longer attracted to a magnet. However once the piece of iron cools down to below the Curie Point, it regains its ferro-magnetic behaviour. This little heat engine uses the Curie Effect. A small piece of aluminium wire is suspended from a brass bolt - neither of these two metals are ferro-magnetic. However at the end of the aluminium wire is a little loop of nickel alloy wire, which is ferro-magnetic, and which has a very low Curie Point. Normally the loop of nickel alloy is attracted by the strong neodymium magnet, which is placed at one side. So the default position of the aluminium wire is at an angle of about 45 degrees, attracted by the neodymium magnet, although the wire is not long enough for the loop of nickel alloy to actually make contact with the magnet. However when you then light the candle, the little motor comes to life. 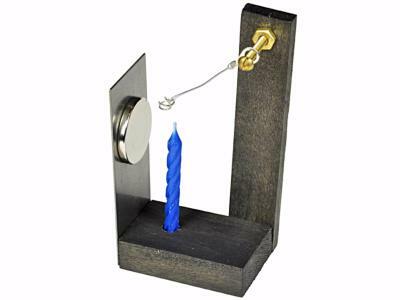 While the loop of nickel alloy is pulled towards the magnet, it will be in the flame from the candle, and will be heated. Once the loop of wire reaches the Curie Point, it loses its ferro-magnetic properties, in other words it is no longer attracted to the neodymium magnet, and the wire now reverts to hanging straight down. The loop of nickel alloy is now out of the candle flame, and starts to cool down. As soon as it falls below the Curie Point, it regains its ferro-magnetic properties, and is then attracted to the magnet again. However now the nickel alloy wire is back in the flame and starts to heat up again, and the whole process starts all over again!The kit requires simple assembly, using a screwdriver.The kit includes... Nickel Curie effect enhanced wire (part of aluminum wire assembly), 1.5" Aluminum Wire Assembly, Neodymium Disc Magnet 1" Diameter x 3/16" Thick, Birthday Candle, Brass Machine Screw & Nuts, Wooden Side .75" x 4" x .25", Base 1.25" x 2" x .5", Steel Plate 1.25" x 3" x .032". Instructions included. Worked as described... delivered in a timely fashion... well packed. Thank you!